Description: HydraMaster customers across the country sing the praises of our award-winning MultiPhase™ Odor Counteractant. It is popular for two main reasons - It’s highly effective and customers love the scent. This contact-deodorant is perfect for effective removal of dog or cat urine and a variety of tough organic and non-organic odors. Usage: For most applications, mix 1 part MultiPhase to 4 parts water. If odors are more severe, MultiPhase can be diluted stronger. 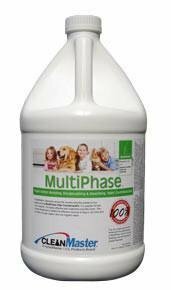 As a cleaning additive, MultiPhase mix 1-2 oz. with 1 gallon of water for portable cleaning or 1 qt. per 5 gallon container for truck mounts.